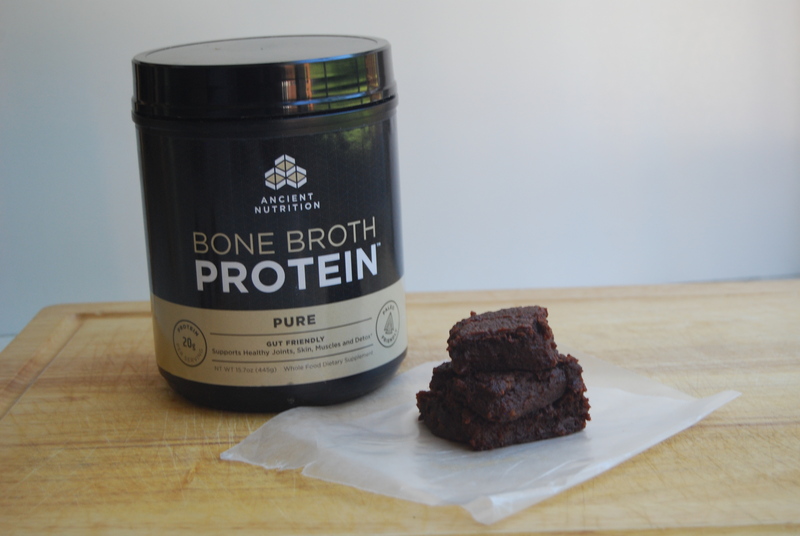 The recipe for these delicious paleo brownies with the glorious bone broth protein powder is here. If you’ve read any of my blogs, or checked out my website, then you know I love bone broth. As someone with lyme disease, I have suffered tremendously with gut and joint problems and bone broth has come to save the day… day after day after day. You can read about some of the positive health benefits of bone broth here. Preparing for my thru hike, I drank buckets of bone broth. To repair my body afterwards, I drank buckets of bone broth. I can’t tell you how many times I said during my thru-hike, “I just wish I had some of my bone broth right now! I know that is what I need!” I probably said this in tears after a 20 something mile day when my joints ached. Luckily, I was fortunate to have eaten extremely well on my 2015 Appalachian Trail thru hike. I survived eating tons of coconut oil, an amazing cauliflower granola I made with this recipe, and grass-fed meat jerkies, generously donated to me by a variety of amazing companies that believed in my mission of promoting nutrient dense options for backpacking. I also strongly believe that without these foods, I would not have made it. I found out after the trail that I had lyme disease… and probably had it for years. I am certain that without these foods to keep my inflammation in control, I could not have physically finished the hike. After my hike, bone broth became an even stronger staple in my diet. As the lyme disease got worse, bone broth was one of the few things that kept the symptoms in check. When a symptom became too much to bare, I knew I was going to have to eat a few days of soups to bring the joint pain, headaches or fatigue back into a manageable place. Needing to make bone broth all the time, however, was making my desire to wander and travel very difficult. I needed bone broth to live, but I needed to backpack and explore to feel like I was normal again. Because of this, I had to cut short other backpacking and travel trips, because my body couldn’t handle going too long without my soups. All that being said, this past summer, I discovered that Ancient Nutrition had started to make a Bone Broth Protein Powder, using organic and pastured raised chickens. The protein powder is literally just dehydrated bone broth. I immediately bought the pure flavor, tried it in smoothies and on its own. I loved it. I then bought the vanilla and the chocolate, and began experimenting making baked goodies and ice cream with it. I loved it all, and still was feeling the positive effects of bone broth. Finally, I had a form of bone broth I could backpack and travel with. These days, I don’t go anywhere without my backup Bone Broth Protein Powder. I take it backpacking, rock climbing, car camping and with me to work. My favorite breakfast at the moment is a pumpkin smoothie with the vanilla Bone Broth Protein Powder. My favorite dessert are my sweet potato protein brownies using the pure, vanilla or chocolate Bone Broth Protein Powder. So, if you are planning an upcoming thru hike, backpacking trip, nomadic adventure or even just looking to eat a little healthier, I highly suggest you bring along some of this glorious bone broth protein powder. If you do want to buy some and also want to support some of my future travels, I suggest you buy through this link. For each purchase made through this link, Surthrival donates some of the proceeds to my future travels. To be clear, I am supporting this product because I love it and you can buy it wherever you like. Your support of my blogging and traveling is an added bonus!